Nigeria's government has welcomed a 60-day ceasefire declared by the main militant group in the country's oil-rich Niger Delta region. The military said troops would remain in the region, but would not attack militants from the Movement for the Emancipation of the Niger Delta (Mend). Mend, however, said a partial pullout of troops was a condition of the truce. The group also threatened to call off its truce immediately because a gunboat had been sighted near one of its bases. The ceasefire was declared after one of Mend's leaders, Henry Okah, was released from jail under an amnesty. Both sides have now called for further talks. Ufot Ekaette, minister for the delta region, told the BBC's Focus on Africa he was confident that a lasting peace could be framed within the next 60 days. "That's a good time for us to work with them [Mend], chat with them and come out with some conclusions," he said. Mend promised to monitor its own ceasefire, but said it would not enforce the deal for other militant groups. Shortly after declaring the truce, Mend released a statement saying it was alarmed at reports of a military force approaching one of its camps. 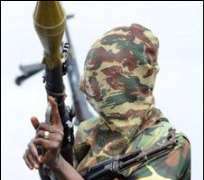 "Barely 12 hours into our ceasefire, the military Joint Task Force (JTF) has dispatched seven gunboats with heavily armed troops from Warri and are headed towards one of our camps located around the Delta/Ondo state border," it said. "If this information from a very reliable source within the JTF happens to be true, the ceasefire will be called off with immediate effect." Military spokesman Col Rabe Abubakar denied the report, saying the army was "implementing faithfully" its amnesty deal - which included a pledge to make no troop movements. However, he said the army would continue to provide escorts for oil workers and tankers. The government offered militants an amnesty three weeks ago, promising a rehabilitation programme, including education and training opportunities. Critics say the amnesty is unlikely to work because the unrest is not a straightforward political struggle. Mend says it is fighting to drive out the military and oil firms, and to give local people more control over the natural resources. But its campaign has been tainted by violent kidnappings of civilians and the theft of oil.